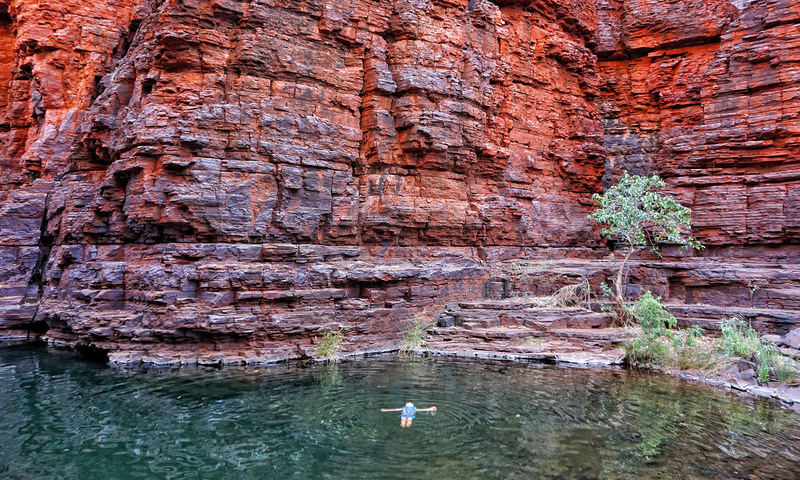 Karijini: have we found Australia’s best national park? Australia is extremely blessed when it comes to natural wonders, and many of them can be found in our excellent array of national parks. 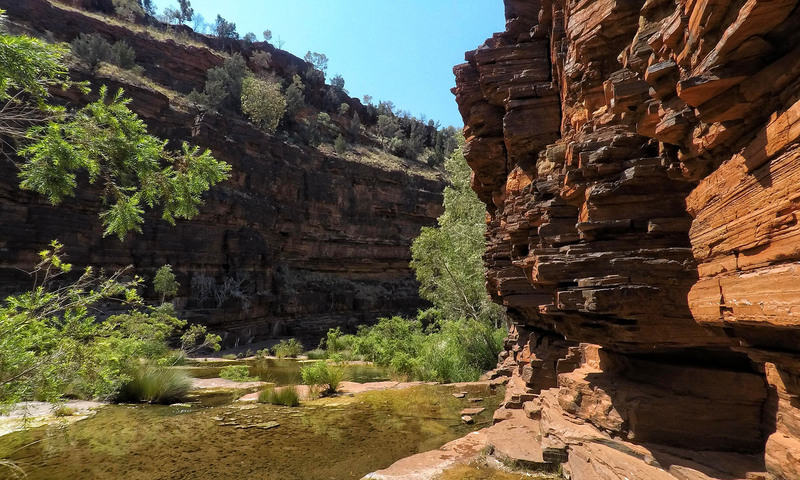 This means choosing your favourite can be hard, but for us, Karijini is definitely up there with the best. 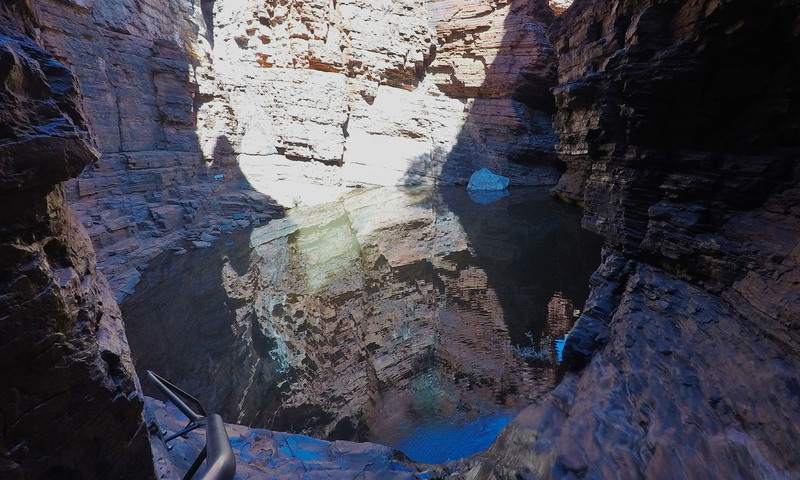 Now if you’ve never heard of Karijini National Park, then you’ll find it up in north-western WA in the heart of the Pilbara region, near the mining town of Tom Price. Many people choose to incorporate it into their ‘big lap’ by cutting inland at either Port Hedland or Karratha, then going from Karijini across to Exmouth (or vice versa). For the most part, it’s easily accessed on paved roads, meaning you can visit regardless of what vehicle you drive, but some of the roads within the park are 4x4 only. Karijini is Western Australia’s second largest National Park, and it’s well known for its stunning geological features (otherwise known as pretty rocks! ), beautiful gorges, and icy cold water. Which Gorges should I visit? 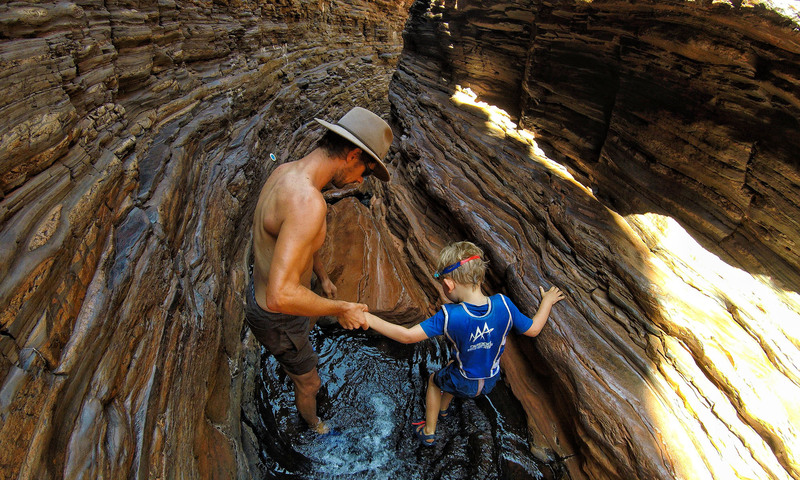 There are so many fantastic places to choose from in Karijini, and if you have the time and the energy to hike all the gorges then I totally recommend that you do, as each and every one is unique and special in its own way. But if like most people you are a bit gorged out (particularly if you’re doing an anti-clockwise lap and you’ve just been on the Gibb River Road! ), or you have limited time or limited fitness levels then you’ll have to pick which ones you’ll visit, and which ones you’ll save for next time. This is not an easy choice to make, so we’ll list a couple of our favourites to help you get started! Definitely one of the most popular gorges in the park thanks to its close proximity to the campground, but also because it’s relatively easy to access and has some excellent swimming holes. 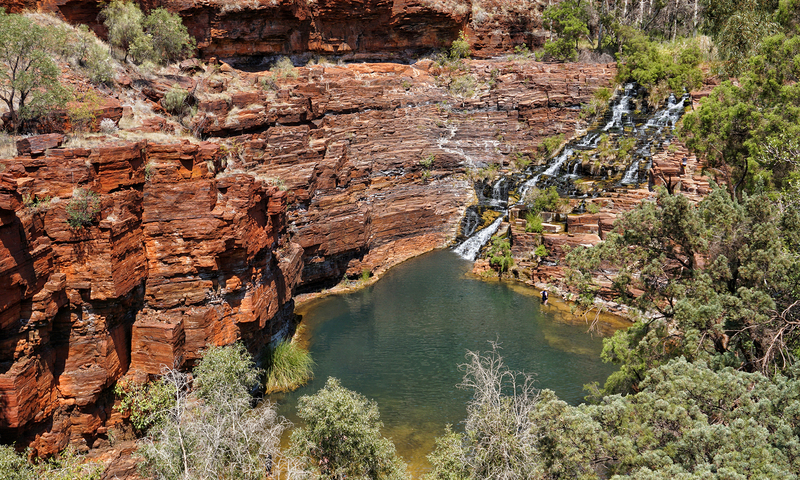 Fortescue Falls & Fern Pool lie at one end of the accessible part of the gorge, with Circular Pool at the other. You can take the steps down at either end, have a swim and come back up. Or you can do a roughly 7km loop like we did, leaving from the Circular Pool car park, walking along the top of the gorge, down into Fortescue Falls and Fern Pool for a rest and a swim, then down the middle of the gorge to Circular Pool for another swim, and up the side of the gorge back to the carpark (or the same thing, but from the Fortescue Falls carpark). This is a class-5 walk but don’t let that put you off – once you get down the steep gorge sides, the walk along the bottom isn’t particularly challenging. 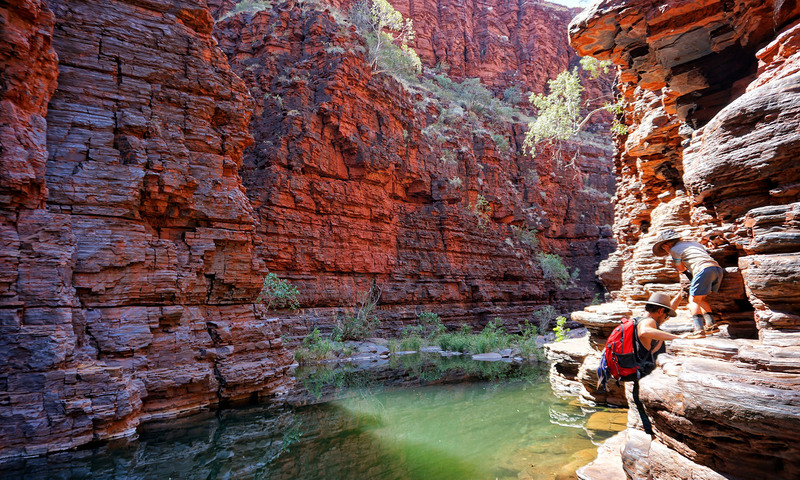 And it’s well worth it – Knox Gorge is one of the most visually stunning gorges in the park and has a beautiful clear swimming hole partway along the walk. Unlike all the other gorges we actually had this one completely to ourselves! Another class-5 walk, but fortunately only a short one. If you want to visit Kermits Pool, which lies at the end of this walk, then beware, you are going to get WET! Hancock Gorge is also the home of the infamous ‘spider walk’, a narrow section of gorge that requires you to walk like a spider with hands on one side and legs on the other to avoid walking through the water at the bottom. However, we didn’t bother spider walking, choosing just to walk through the water at the bottom. Actually, in many parts of this and Weano Gorge the safest option is just to get wet! Hammersley Gorge is a bit of a trek from the rest of the park and is only accessible by dirt roads. But once you get there it’s one of the easiest swimming holes to access – only a short walk down. 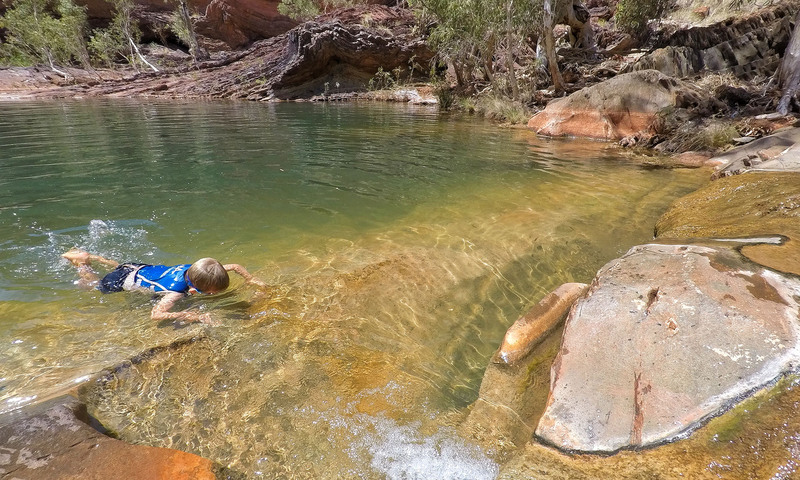 You can swim in the main swimming hole, or you can choose to swim down the gorge and go exploring as far as you choose. 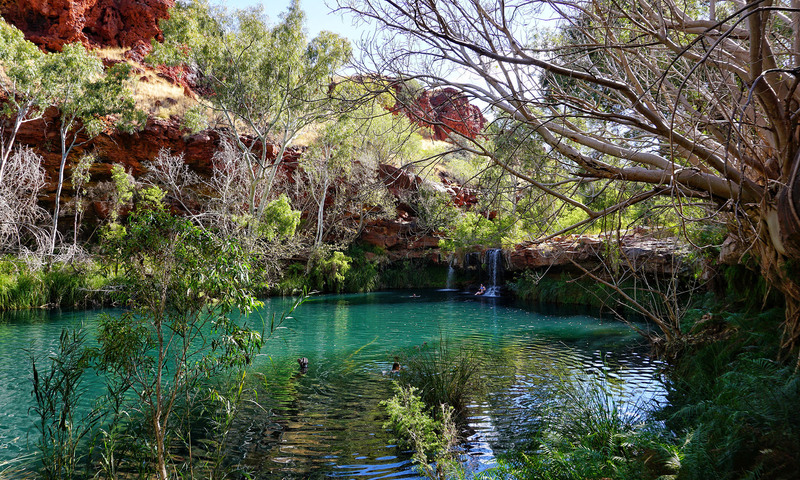 Hammersley Gorge is also home to one of the most Instagrammed places in the park – Spa Pool. Unfortunately though due to a high number of injuries from people trying to get the perfect insta-worthy photo this part of the gorge is now out of bounds – we chose to respect the signs asking not to access it, but certainly plenty of people do not. 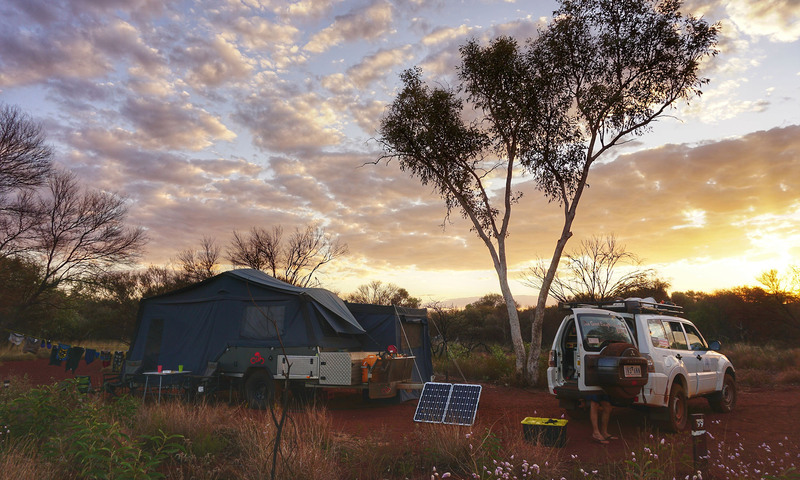 One of the great things about Karijini National Park is the variety of camping options you have available. Now at first glance, it may not seem like much but you have the option of staying in a basic national park campsite, a more upmarket campground with hot showers and powered sites, or even a free camp just outside the national park boundaries. Conveniently located right by Dales Gorge and only a 10-minute drive from the visitor centre, this is the only national park run campsite in the area. As with most national parks in WA it’ll set you back $11 per adult, per night. It has bins and drop toilets, but not much else in the way of facilities. And even though it is HUGE it can still fill up in peak times. They don’t take bookings but if you rock up and it’s full they have an overflow park you can camp in for the night until a place becomes available. The sites are spacious, and you’ll be a decent distance from your neighbour, but shaded spots are very limited. There are no EFTPOS facilities so make sure you bring cash. The Eco Retreat is found over by the western gorges (Weano, Hancock, Knox etc) and is the option you’ll need to take if you want a campsite with showers. However, you’ll still need to be self-powered as they only have unpowered sites available. This one costs $20 per adult, per night. This free camp is only a few kms from Hammersley Gorge making it a great option for visiting Hammersley but a bit of a drive from the rest of the gorges in the park. It’s completely free but has no facilities so you’ll need to be self-sufficient. And unlike the other two options, it’s outside the national park boundaries meaning dogs are allowed. Be aware that the closest hospital is an hour and a half drive away. If you injure yourself in one of the gorges (a definite possibility) it could take many hours before help can arrive, and when that help does arrive I can almost guarantee that they will be volunteers from the SES and St. John Ambulance. So keep that in mind if you choose to ignore the signs telling you it’s not safe to go any further (like many people do). I know if I was a volunteer and had to spend my valuable time rescuing people (for free!) that had ignored warning signs I’d get tired of it pretty quick. It’s a good idea to carry an extensive first aid kit in the park and at the very least some snake bandages on all the hikes. Nathan actually got bitten by a snake while we were in the park, at Dales Campground, so we experienced the need for this first hand, and thankfully all turned out ok (after a stressful drive to hospital in the dark and an RFDS flight to Port Hedland). There is only Optus reception available in the park, no Telstra. You’ll find bins (in a cage to keep the dingos and crows out) + non-potable water available near the turnoff to the visitors' centre. The visitors' centre also offers hot showers (for a small fee). This was our second visit to Karijini and I’m certain it will not be our last. Everyone we know who has been has loved it, so it’s definitely one worth putting on your list! 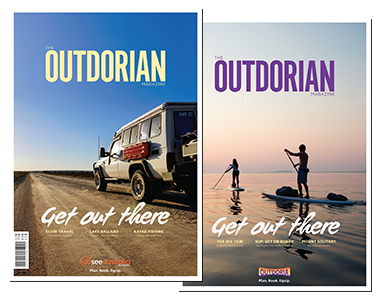 Check out our parks in WA or browse stories from our community of travelling contributors.